We were about to depart San Francisco rental house for our journey through Big Sur to Death Valley and Las Vegas. As usual, I started booking accommodation last min. We tried to reach Death Valley on one stretch and finally decided that we needed to make one stop to avoid fatigue, especially for the little one. Getting her feel sick was the last thing we would like to have. So yes, I was thinking there was no proper hotel around, so tried to browse AirBnB. I sent out three requests. Interestingly, I got the replies within 2 hours. One girl had a nice apartment, and was showing open for two nights, including one night I tried to book. But she replied to say just very last min, she got one friend come to visit her then her room was not available anymore. OK. The next one was just saying “sorry it was not available.” Alright, then why didn’t mark the calendar to be more clear? The third one gave me a bit more explanation – with the message as the screenshot. I guess they were trying to show that they would like to help, but home is not set up for small children. So could not. So far, I felt that we were not welcomed by any hosts that I contacted because we have a 1.5 year old, and probably we only stay for one night. Never mind, I decided to try hotel, and wa-lah, maybe need to drive another half an hour more than I would like to, but it was easy to rent a hotel just for one night and everybody there would welcome you with a big smile. 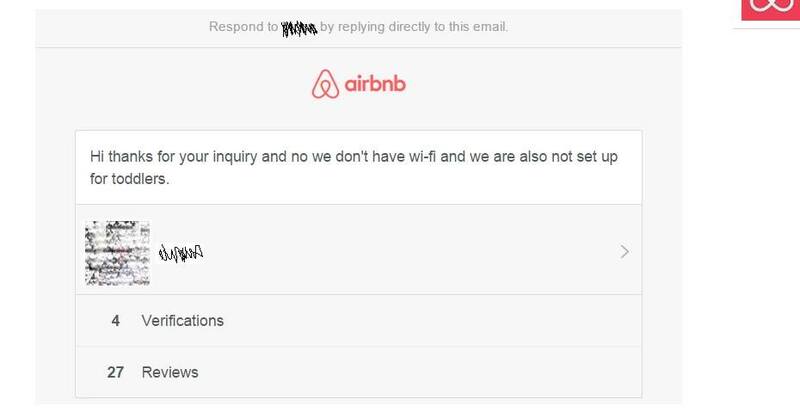 This was not a great experience from AirBnB, but maybe just happened that these three hosts around this area don’t like children to be in their house, I understand. But if that’s the case, please mention that in your profile and save the traveler’s time to search and so on. At least I will do so, if I were to host. Great for everybody.